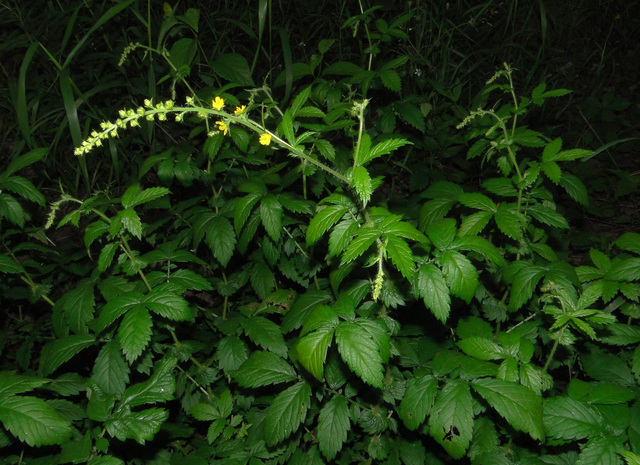 Agrimonia gryposepala.© Copyright Bobby Hattaway 2011 · 5.discoverlife.org (Accessed 2014). Agrimonia gryposepala is a perennial herb, from a stout rhizome, with fibrous roots; stem 30 cm to1.5 m tall, stout, glandular-hairy. Leaves alternate, widely spaced, pinnately compound, leaflets 5-9, elliptic,1.5-5 cm long, to 2 cm wide, coarsely toothed, with 1-3 pairs of much smaller leaflets between larger pairs, hairless above, glandular-dotted below (use lens or hold up to light), stipules leaf-like, somewhat heart-shaped, 1-2 cm wide, toothed. 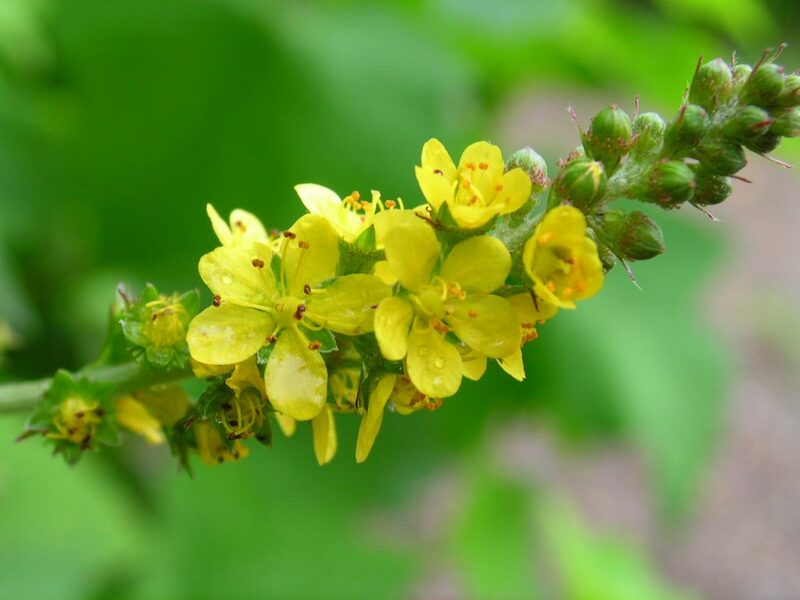 Flowers yellow, radially symmetrical, about 0.7 cm long, petals 5, base of flower (calyx tube) enlarged, rimmed above with hooked bristles; inflorescence stem hairy and finely glandular, unbranched; blooming July-Aug.
Agrimonia gryposepala.fruit. commons.wikimedia.org (Accessed 7/2017). Fruit dry, top-shaped, old calyx tube to 0. 5 cm long, top of fruit covered with hard, hooked bristles, above calyx tube, tip beaked, 2-seeded. Dispersed by attachment to fur or clothing. 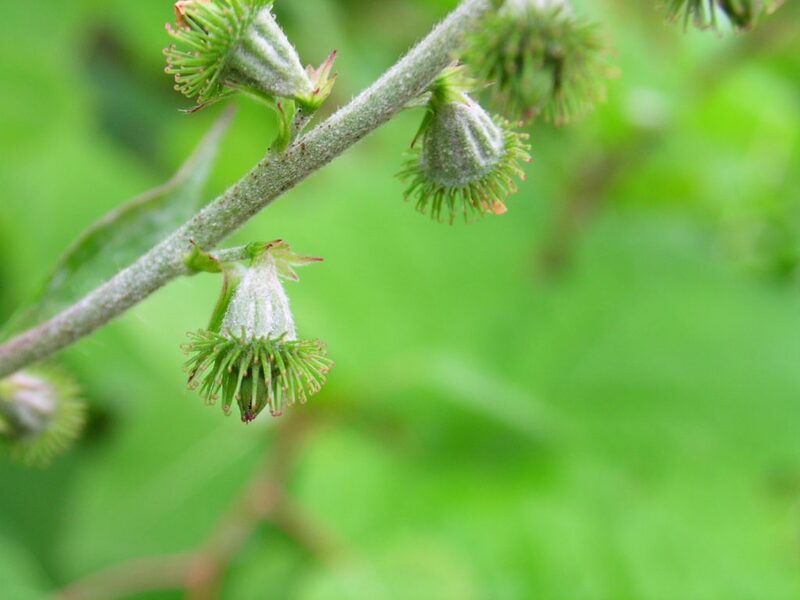 Notes: Winter plant with spike-like racemes of small, top-shaped fruits, upper half bristle-covered (Brown 1976).